It was the first time I'd properly made an Amaretto cake (and it's now a stock fave!) following the Hummingbird recipe but adapted- what's really special about it is that you make an Amaretto syrup which you pour over the warm cake when it's just out of the oven. It all soaks in but leaves a glossy sticky top which is so yummy! The filling was Morello cherry jam and cream whipped with confectioner's sugar, but I also cut some small holes in the top (like you would when making butterfly cakes) and filled them with jam. 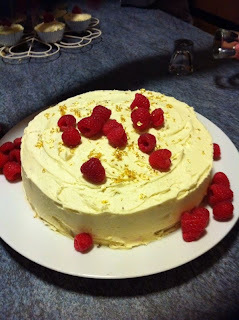 White chocolate and Amaretto frosting on top, decorated with edible gold flakes and raspberries. A classy cake for one classy lady. 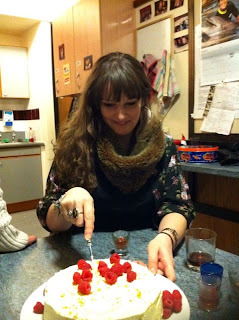 (Taken with not-so-classy shots of raspberry liqueur which was a good idea at the time) Happy Birthday Rosie!